When a good family friend, Christine, heard that I had an extra butternut squash laying around and was looking for a good recipe, she sent me her favorite butternut squash and pear soup recipe. Christine is the type of person only few are lucky enough to know in their lifetime. She and her husband are amazing cooks, big on family values and are a lot of fun to be around. Needless to say, when Christine sends you a recipe, you know it is going to be good! Christine and her husband currently reside in the Seattle area where it is soup season more often than not. Whenever they come down to California to visit their son and daughter-in-law, they always invite us over for a home cooked meal. Some of our best memories are when we are gathered around the table with them. Whenever I'm in the kitchen prepping a meal, I'm usually thinking about how the dish is going to turn out, or who I am making the meal for. However, when I was chopping and dicing everything for this soup, I was thinking about the person who gave me this recipe and how I hope to be able to make an impression like Christine has had on me, not only on my kids some day but also their friends. I made this for my husband and I and served it a long side corn bread muffins that I added fresh chopped rosemary and thyme and Maldon salt to. It was the perfect addition to dunk into our soup. You could certainly serve it on its own or with a loaf of crusty bread and a side salad. One bite into the soup and you will realize why Christine sent this recipe to me! It is so creamy and filling yet light and satisfying. I honestly have never been a huge butternut squash soup girl but I sure am now. It is the perfect soup to make on a rainy day for either lunch or dinner, or a great dinner to make if you have guests in town for the holidays. I topped each bowl of soup with a few crumbles of fresh goat cheese which gave it some extra creaminess and flavor, and some fresh rosemary. I am forever thankful to Christine for passing a long this amazing recipe, and for her beautiful friendship. I am also so thankful for each of you who encourage me on this blogging journey and give me a reason to share all of these yummy recipes. I hope you all have a wonderful Thanksgiving! In a 4-quart saucepan melt the butter over medium- high heat, and add and sweat the onions. Add squash and pears and sweat those too a bit. Pour in the stock, enough to submerge solids. 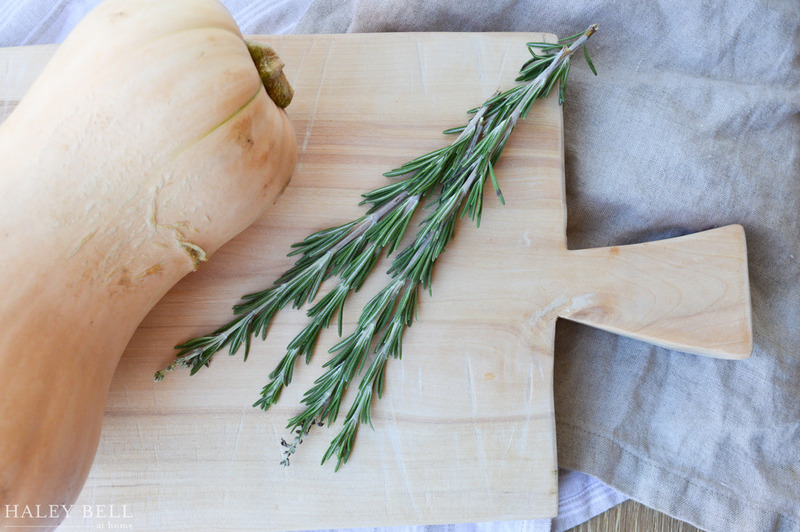 Add a sprig of rosemary and ginger and bring to a simmer and cook until squash is fork tender, about 15-18 minutes. Remove the sprig of rosemary. Puree with immersion blender. Add a touch of cream and season, to taste. Serve and enjoy!